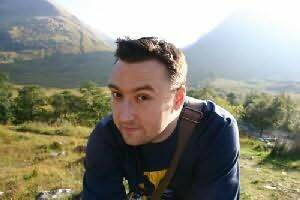 Barry Hutchison is an award-winning children's author and screenwriter. His first book - INVISIBLE FIENDS: MR MUMBLES - was published in 2010 to critical acclaim. The book went on to win the Royal Mail Award for Scottish Children's Books in 2011, by which point two more books in the horror series had been published. In 2012 HarperCollins Children's Books published Barry's comedy fantasy novel, THE 13TH HORSEMAN, which was even more well-received than MR MUMBLES, with fans including the multi-award-winning best-selling author, Neil Gaiman. Shortly after Horseman won the Scottish Children's Book Award, a sequel - The Book of Doom - was published. Since 2008 Barry has written over fifty books for children, including several based on the hit Cartoon Network show, BEN 10. When not writing he is usually visiting schools and libraries to run events and story-writing workshops for kids and adults alike. He recently wrote thirty-six episodes of the CITV comedy series, BOTTOM KNOCKER STREET, starring comedian Phill Jupitus. Barry lives in the Highlands of Scotland with his wife, Fiona, and their two children, Kyle and Mia. His biggest fear is that someone will one day discover how much fun his job is and immediately put a stop to it. His second biggest fear is squirrels.